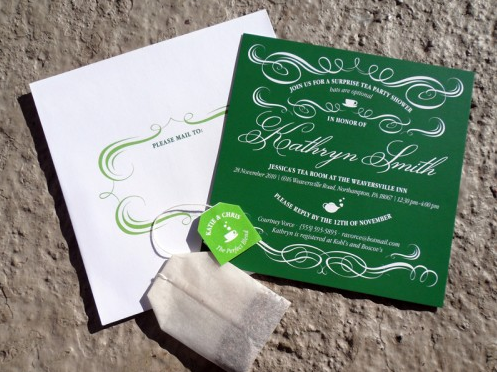 Cute tea party invitations aren’t the easiest to find–even when culling through Pintrest and Etsy. A lot of times tea party invitations use silly fonts and graphics that make them look like they were created in 1995. Sooo, I wanted to show off a couple of the pretty ones that I found. This one I especially love because of the contrasting colors, sweet flower graphics, an the use of contrasting fonts. And isn’t that envelope liner to die for??! This invitation below is so cute! According to Oh So Beautiful Paper, it was designed to look like the front of a vintage tea tin. Maybe that’s why I like it! If something is embellished with lace, my swooning generally ensues. 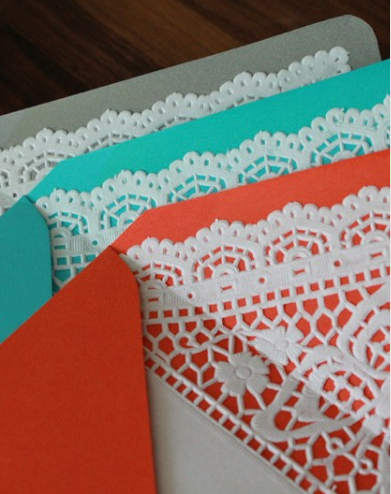 So when I saw these gorgeous envelopes on Etsy, I was on cloud nine. Aren’t they so pretty?! 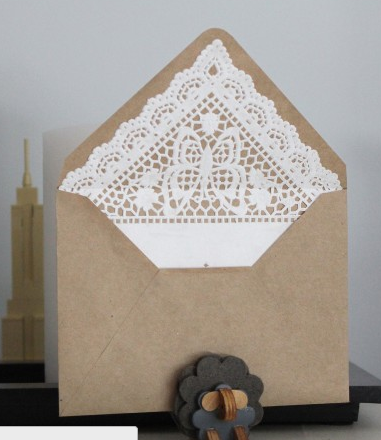 I love the details of the lace! 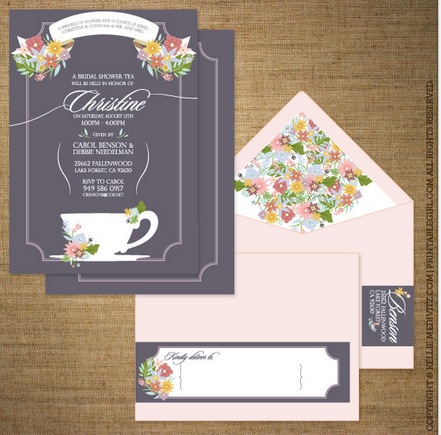 These would be so sweet for tea party or wedding invitations! These liners from Stitched and Adorned are so adorable too! Now that it is officially the holiday season, how about gazing at some pretty green plates to bring us some holiday cheer? I picked out some of my favorite green or green-hued dessert plates from our inventory and wanted to make your screens a bit prettier with them here! So this last one isn’t a true green, but it is a greenish blue and too pretty to not include. Plus how cute is that pinecone that we painted? Lovely. 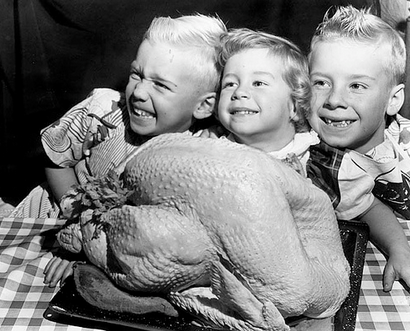 We are so grateful for the support our readers, friends, and family have given us over the past year. Thank you to all of my interns/assistants/miracle workers Allison, Keni, Stacy, and Tiffany whose help has been crucial! Personally, I am so grateful that Something Vintage has allowed me to pursue my passion, making lots of events and gatherings pretty along the way. Thank you from the bottom of my heart! 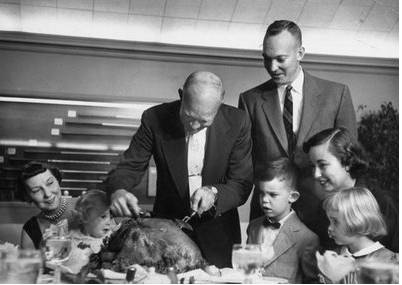 Here are some vintage images of Thanksgivings from our past—here’s to many more! It’s not really a secret that I love to paint everything and anything gold annnnd I’m obsessed with corn. Corn, corn, corn. Hey, I’m from Indiana, what do you expect?? So I ask, why decorate with regular indian corn and fresh acorns when you could paint them gold?! I use Design Master spray paint in “brilliant gold” to paint the corn. It isn’t cheap, but it makes a huge difference when spraying flowers and vegetables because regular spray paint can look coppery. 1. Wrap the husks of the corn in plastic wrap to prevent the spray paint from covering the husks. 2. Shake the spray paint and spray all sides of the corn from about 12 inches back. You can get all sides of the corn by picking it up and rotating it. 3. Ta-daaa! You are done and have lovely gold corn! You can do the same thing with acorns and other fall pretties, like dried leaves, seed pods etc. These are some of the acorns I sprayed last night.